We had an awesome dinner at the Turrialtico Lodge. At the time that we sat to eat, we were the only guests at the lodge. By 9pm, there were 5 more couples at dinner. I had "lomito" (fillet mignon) with mushroom sauce and it was fantastic; perhaps the best that I have ever had anywhere, including France. We rolled out the next morning headed toward the Caribbean Ocean. We went through the mountains and then descended to the Caribbean plain. We found a visitor on our bathroom floor. 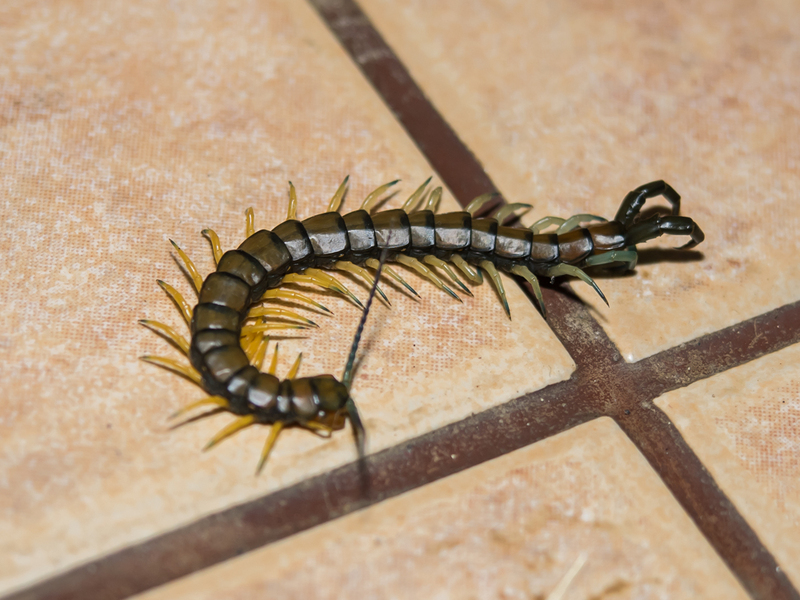 Some centipedes have venomous stingers on their feet. This one appeared to have additional stingers on his rear. 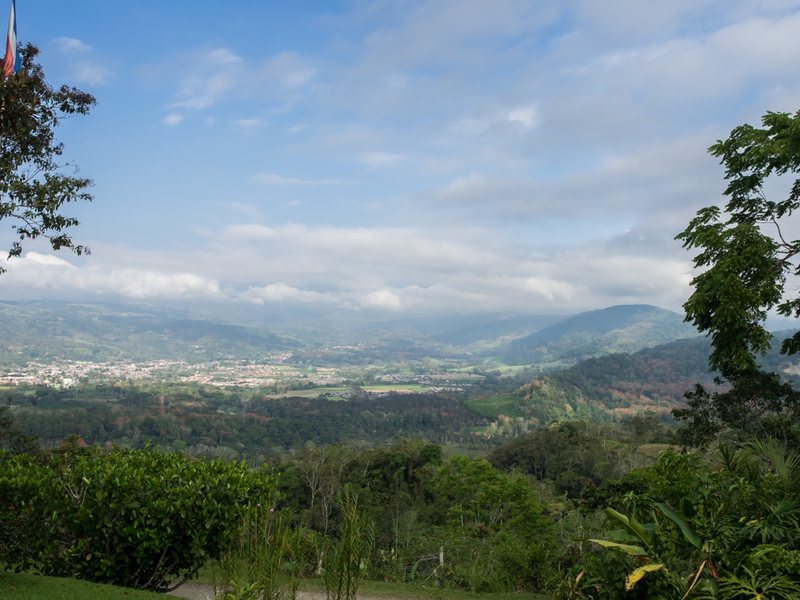 In the morning we got a clear view of the city of Turrialba in the valley below the lodge. 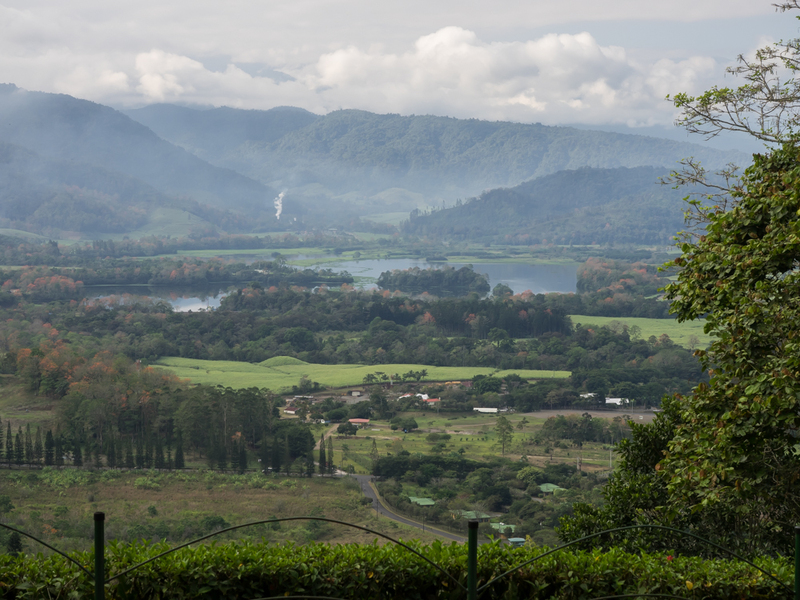 The Turrialba volcano remained hidden by clouds. 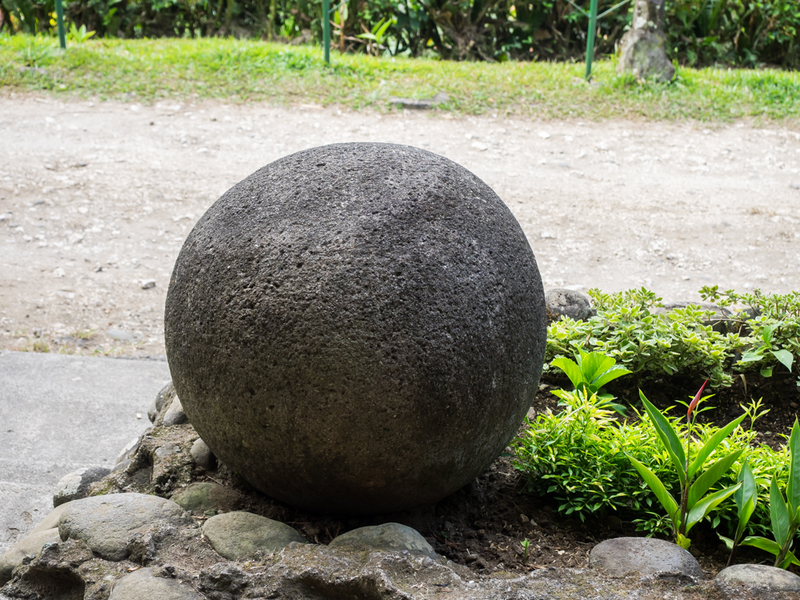 Central America has a number of sites with large spherical stones that were carved by the Meso-American natives a thousand years ago. I don't know if this one is an original or a knock-off. But it either case, it is still interesting. Our view from the second floor of the lodge gave us a nice sense of the scope of the valley to the west of Turriabla. There is a substantial lake there in addition to a sugar cane processing plant. The wall at the lodge had a nice 3D topographic map for the whole country. 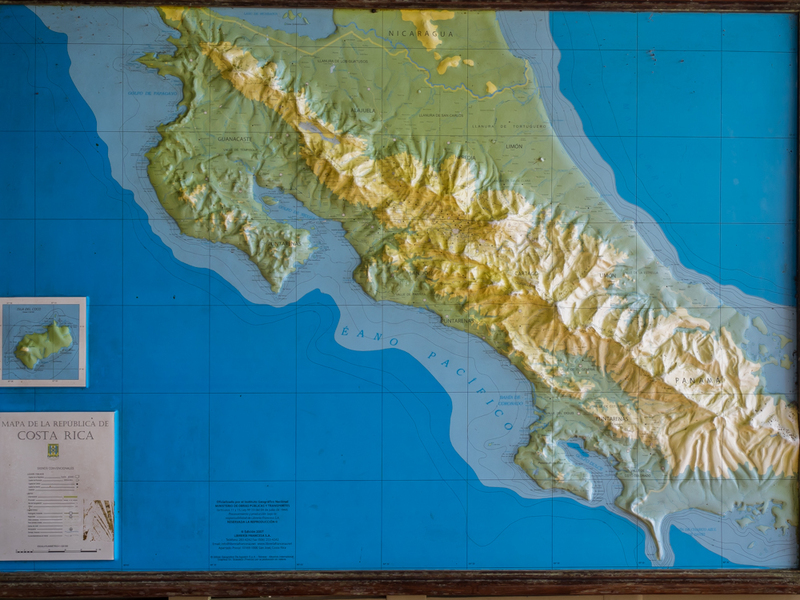 It showed our path would be through the high mountains and then down to the coastal plains. 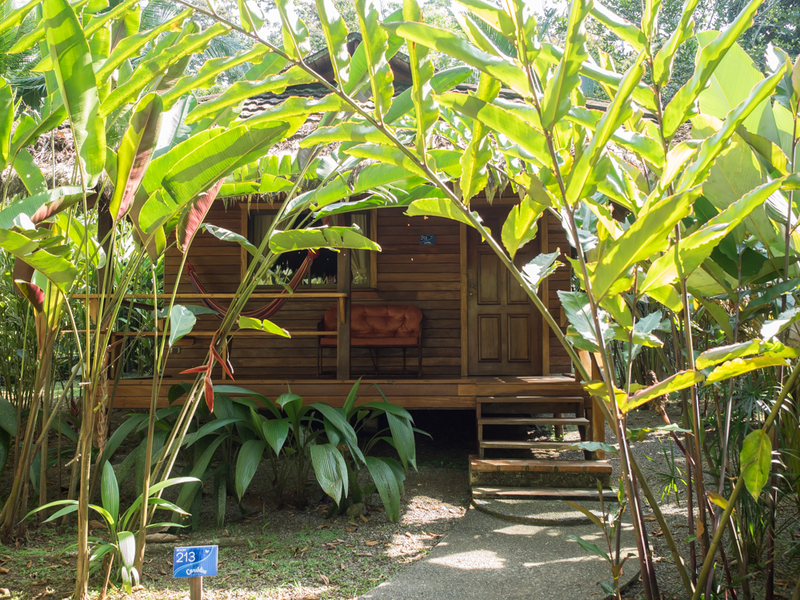 Kathleen and I met the founder/owner of the lodge and spoke with him at length. A very nice fellow with some English skills. But, when combined with my marginal Spanish skills it produced a usable result. He feeds the birds daily and hangs around to watch them eat. 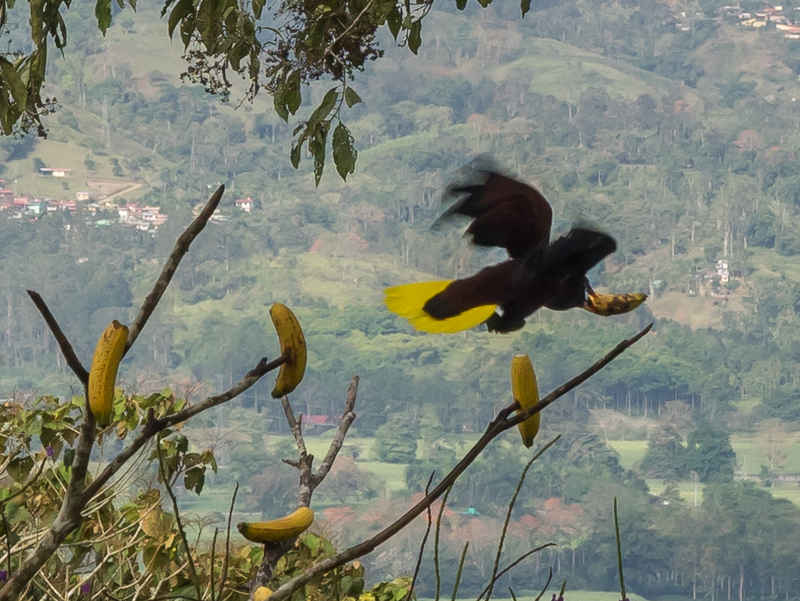 I cropped one of the photos to get a shot of this bird in flight. 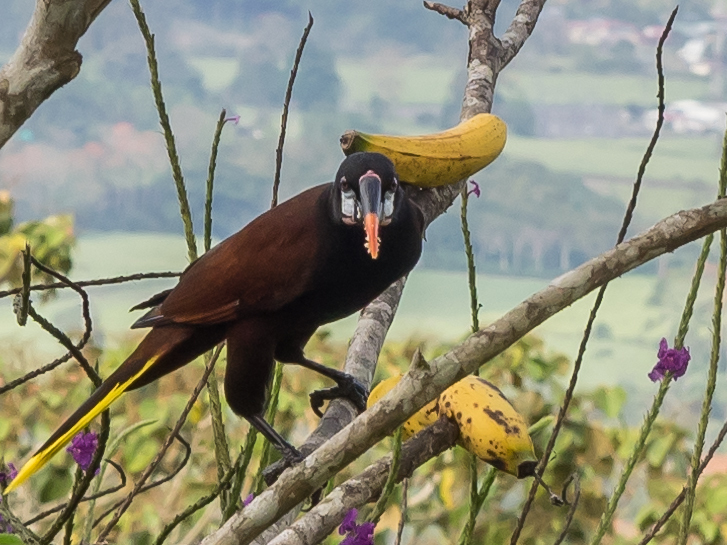 The bird was strong enough to fly away with a whole banana. 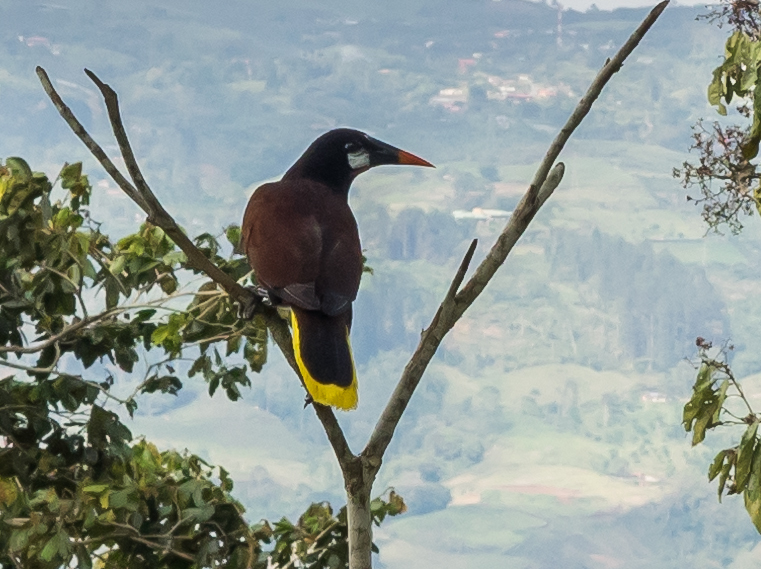 The birds have bright yellow tails and sharp orange beaks. 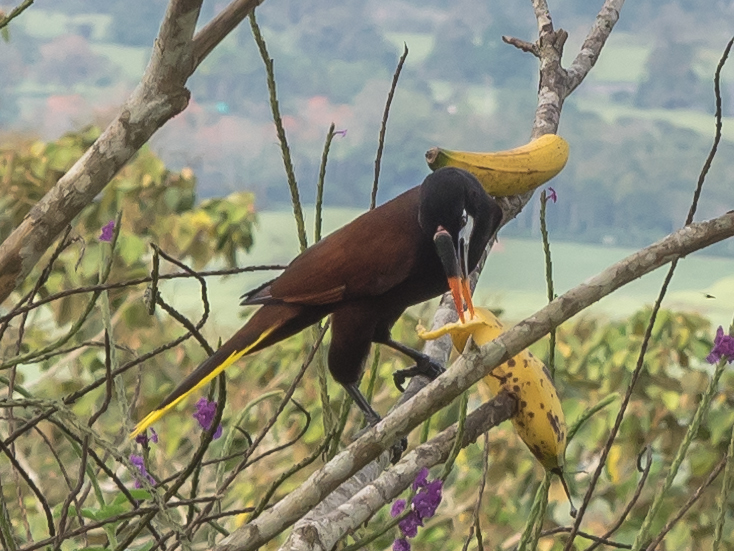 Once the bird had finished eating the whole banana, it came back for more. The bird could easily see me and kept careful watch. If I got closer than about 10 feet, he flew away. 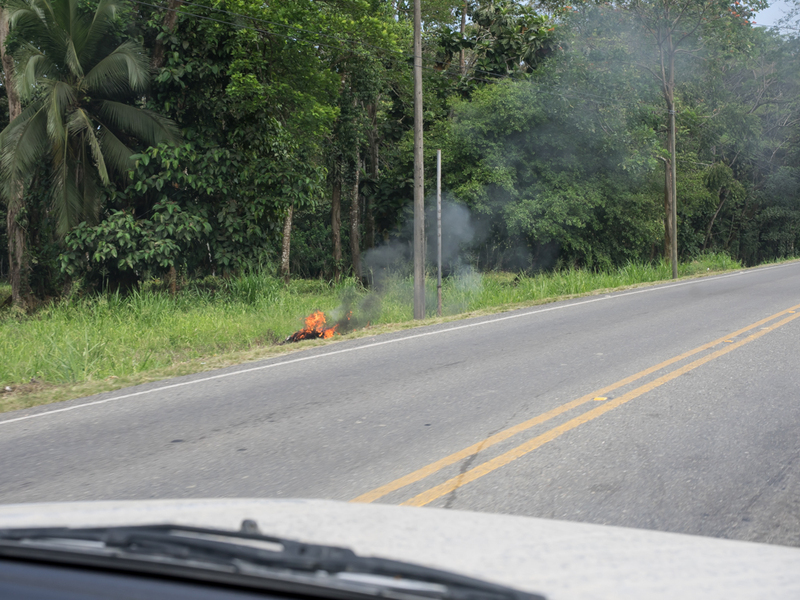 We passed many small road-side fires along the highways we traveled. I assume they were the result of someone tossing a cigarette out the window. But what was surprising was that there was no response to the fire. We never saw a fire engine attacking any fire; no one seemed to care. 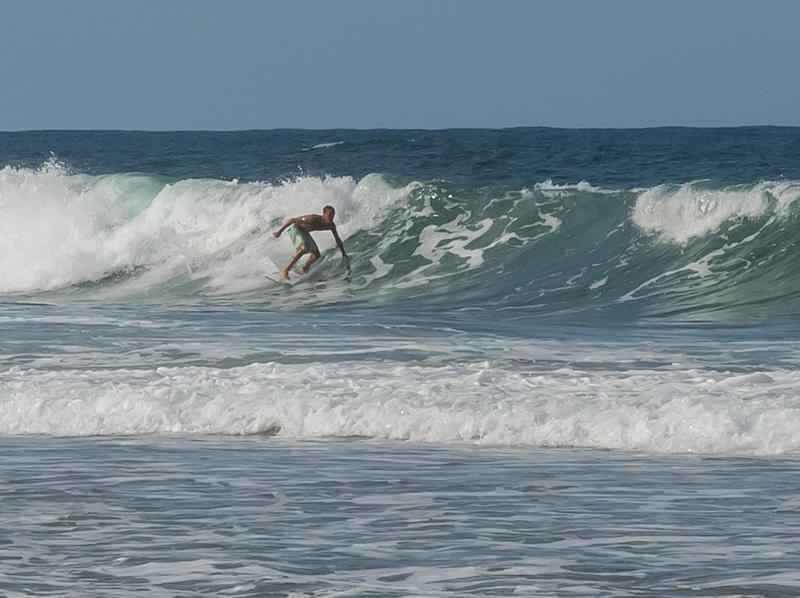 The road to Puerto Limon was heavily traveled and rough. 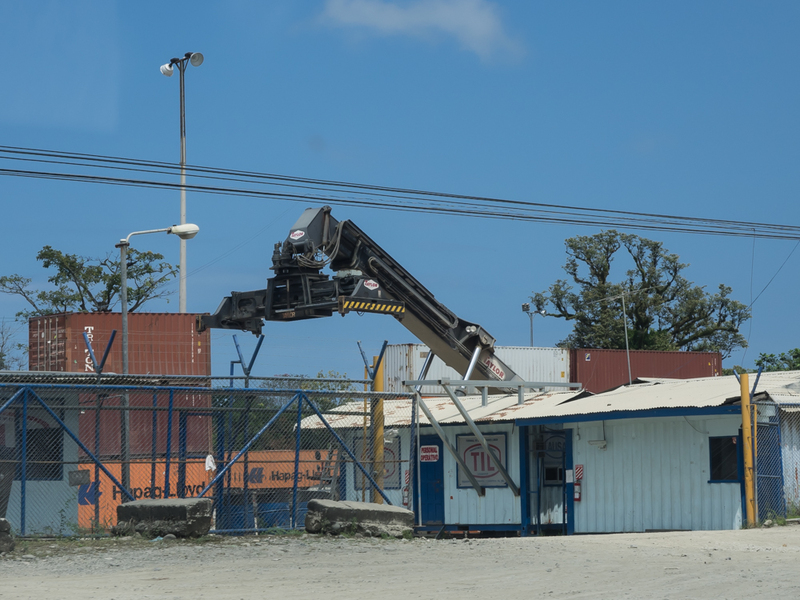 Limon is Costa Rica's major Caribbean port and sees high volume traffic of container shipments. 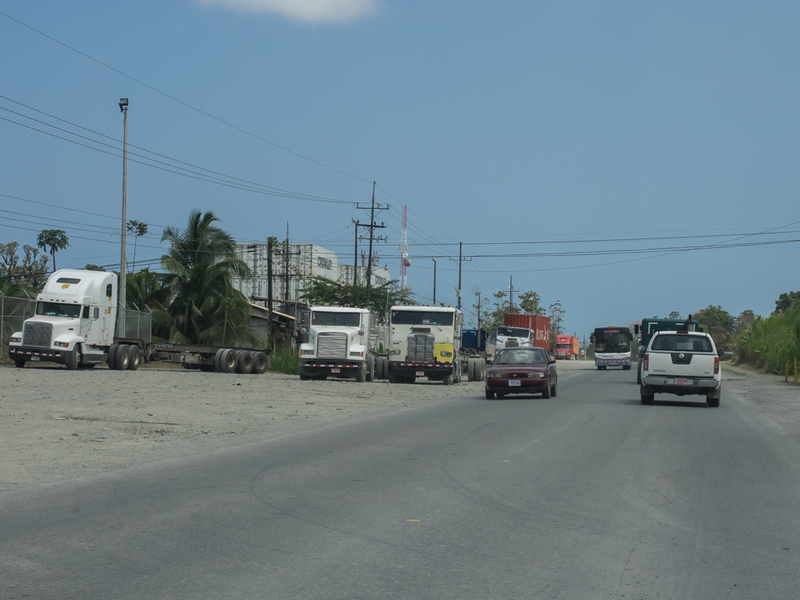 There were plenty of trucks in Limon. The odd device is a container mover. It grips containers from above and picks them up. Sadly, the main portion was blocked by the building in the foreground. 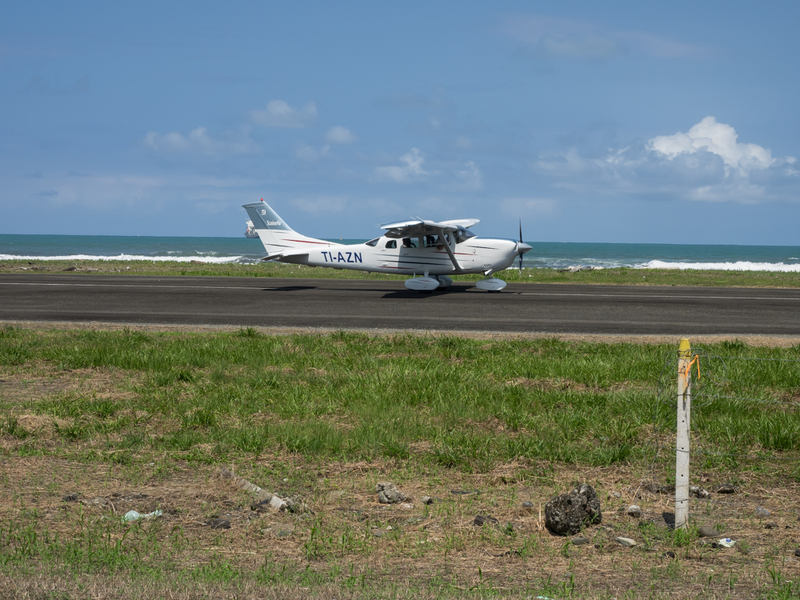 Our path took us right next to the small airfield at Limon. The fence to protect the runway had been broken down and you could walk right onto the tarmac if you wanted. 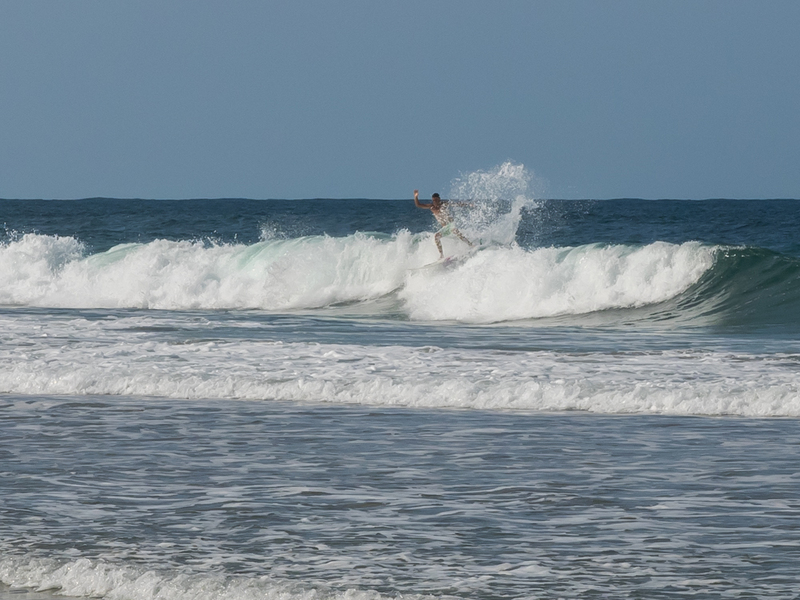 I stopped to get a photo of the surf and a small place came by preparing to take off. 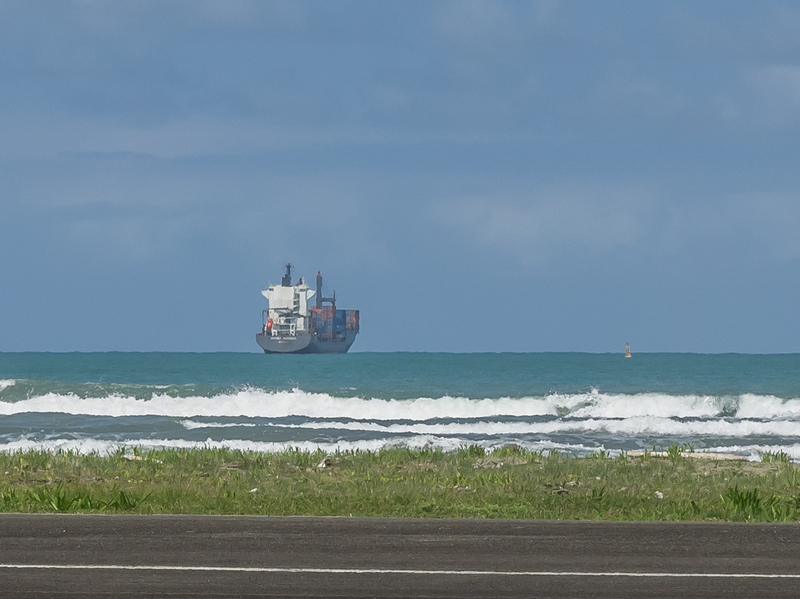 From the airstrip, we could see one of the container ships that makes the run to Limon at anchor in the bay. 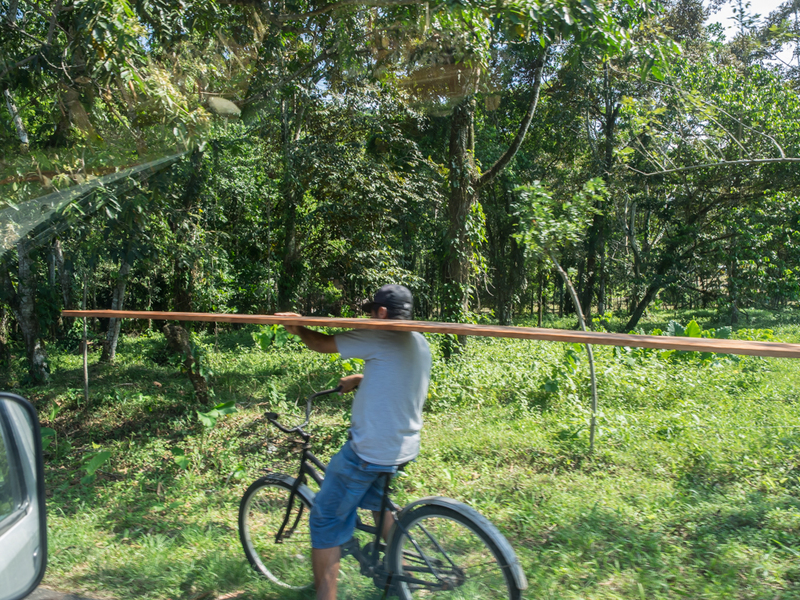 We traveled on the rough road south toward Puerto Viejo and saw this fellow riding his bike with cargo. When you have a long distance to travel and a bike is the only means of transportation, you do what you have to do. 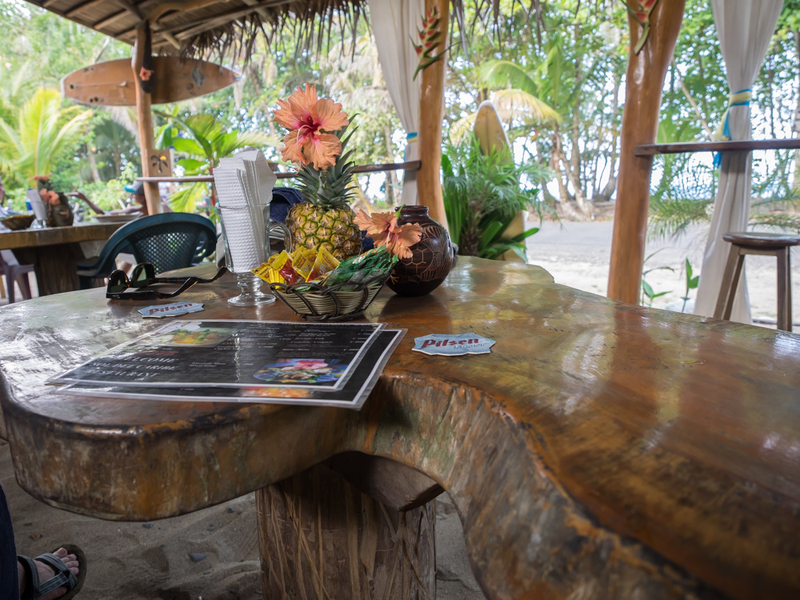 We pulled over just north of Puerto Viejo to check out the bay. The beaches are black volcanic sand. Kathleen choose a place called the Cariblue and they had an open bungalow, so we took it. 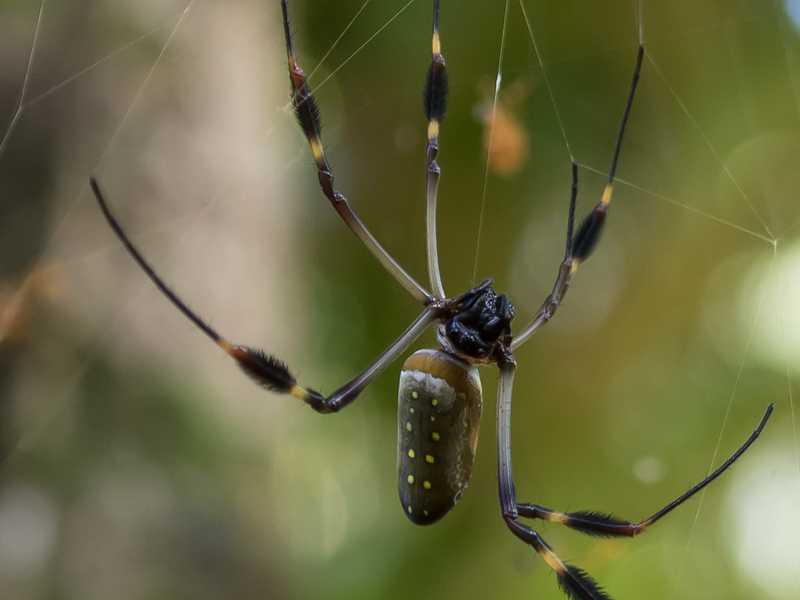 Outside of our bungalow I spotted this odd spider. The web was large, perhaps 3 feet across. 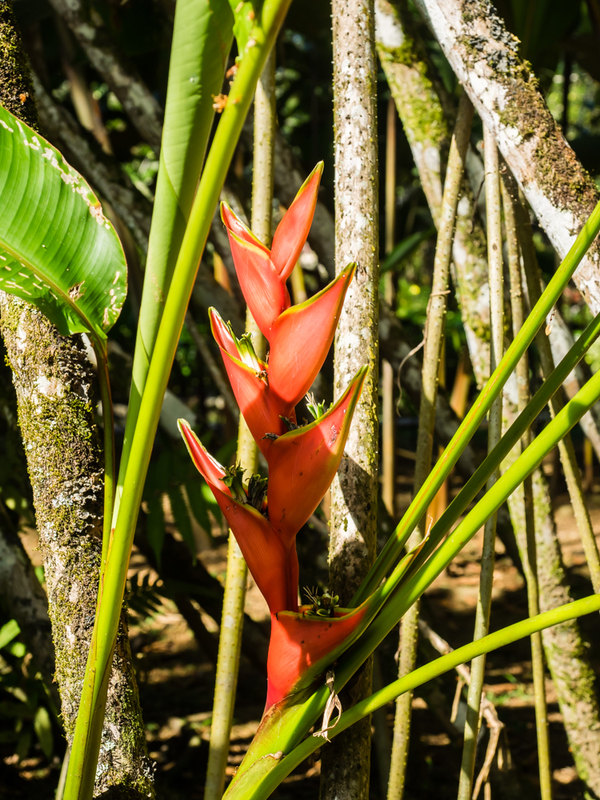 This large flower was in bloom in the brush outside our bungalow. 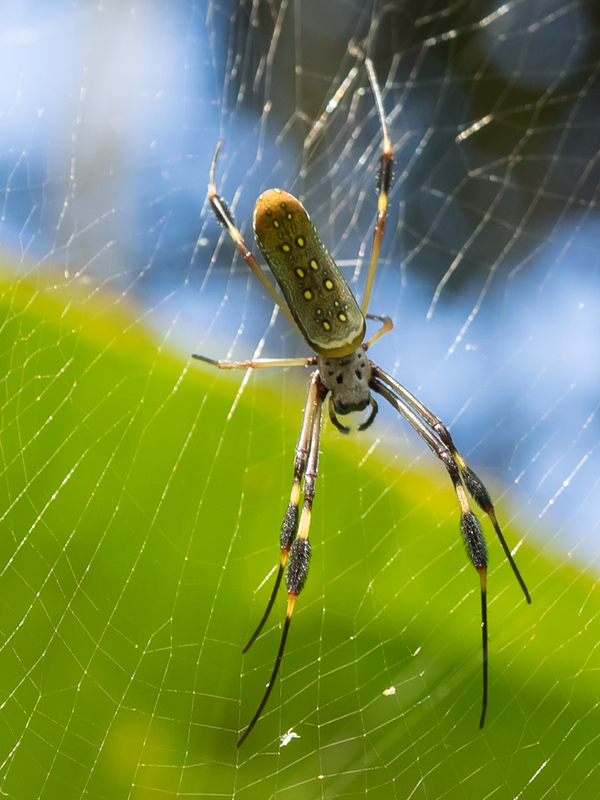 I have to assume after seeing a number of these spiders that they are common. We put on bathing suits and headed to the beach across the street from our place. Sophomoric trick #101: when at beach you encounter a girl with her top undone, spill or drop something on her to cause her to react strongly enough to forget that her top is undone. The fellow next to this girl attempted #101, but failed to generate an immediate response because she was dozing. The "thing" is some kind of dead lobster with long antennae. When she awoke enough to realize what was happening, she asked her girlfriend to assist her, which she did. Note the smirk on the face of 3rd gal on the right. 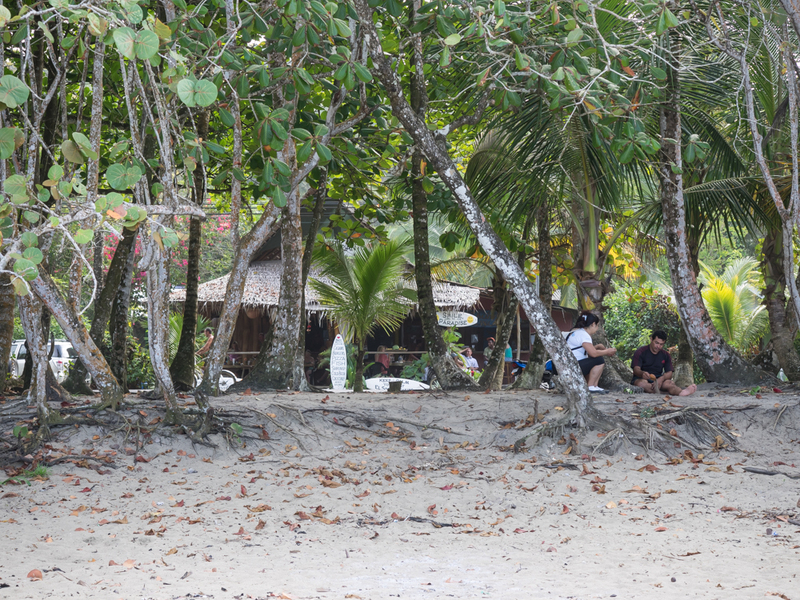 Across the road from the beach was a typical beach bar for this area: thatched roof, open air with tables and chairs loaded with surfer-types. Kathleen was pleased by the temperature of the water but did not venture too far into it due to the very strong rip currents. Words alone cannot express my happiness at not having to view white, bulging, cellulite-dimpled legs of aging gringas on the beach. This couple came strolling by after being in the surf. 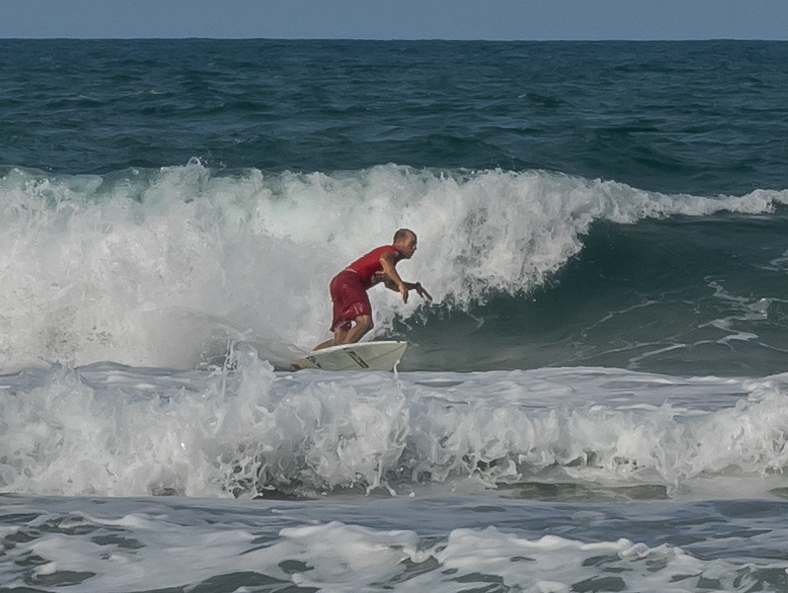 And speaking of surf, there were plenty of folks trying their luck in the waves. 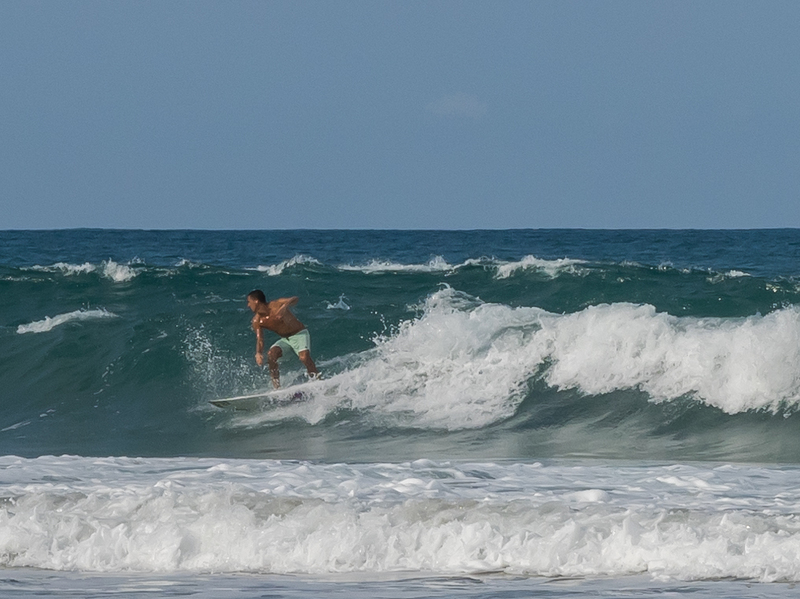 The waves were steady and seemingly had good form. This guy was getting a good ride. This guy was pretty good. We went to the beach bar for a drink, but the service sucked and they did not have the food that we wanted, so we left. We went back to the hotel instead and had cocktails at the swim-up bar. The road from Turrialba to Limon was slow with lots of truck traffic. The trucks had destroyed the road resulting in a really rough trip. 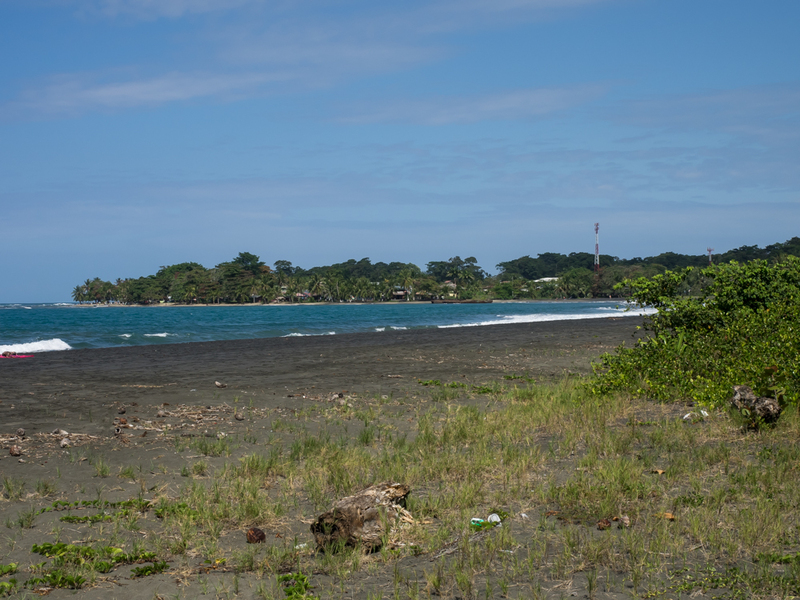 The section of road south from Limon to Puerto Viejo was even rougher, but the beach and jungle scenery made up for it. We were lucky to find a nice room so close to the beach. 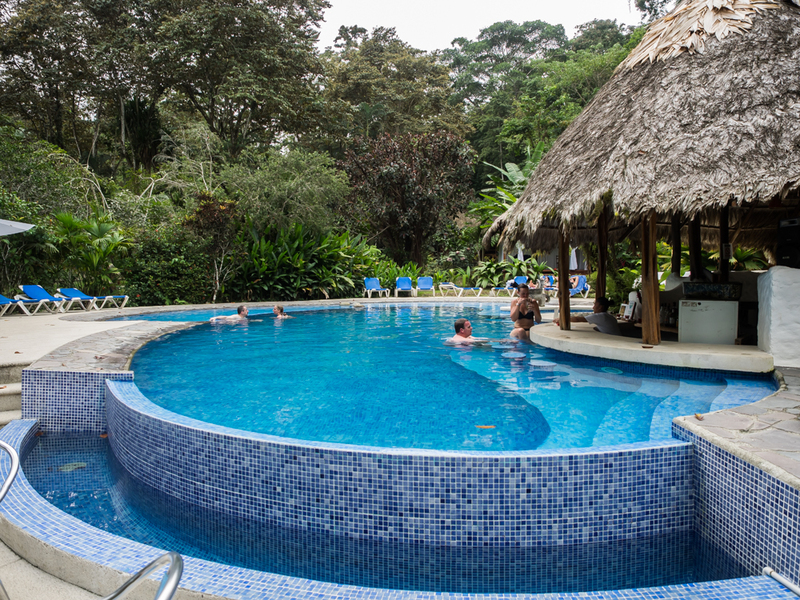 Tomorrow, we stay in Puerto Viejo and look around.